The instrument, which is incomplete, is made up of a disc on which some concentric circles are traced which bear markings characteristic of a nocturnal. 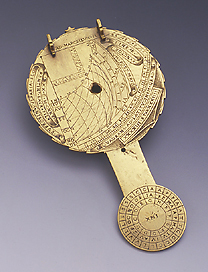 The arm terminates in another, smaller disc, on which the markings relating to the entrance of the sun into the different signs of the zodiac are marked, in the typical style of the Della Volpaia family of craftsmen. The dial, which is calibrated for a latitude of 43? 44', is dedicated 'Ad Marcellum M.', a person about whom we know nothing. The instrument-maker, Eufrosino della Volpaia, was the son of Lorenzo and, like his father, was a maker of dials and measuring instruments.